Online Dictionaries, Glossaries, & more! Overview of language programs available at Eastern. The Languages Department offers a joint program program with the Business Department. Click on the link below to find out what courses are need to complete a adegree in this program. Interested in a career that involves language skills? Take a look at a few jobs that require strong language skills. This information comes from the government's Bureau for Labor Statistics Occupational Outlook Handbook. Here you will find information on how to locate sources related to French, German, Spanish, Italian, & Japanese language studies. 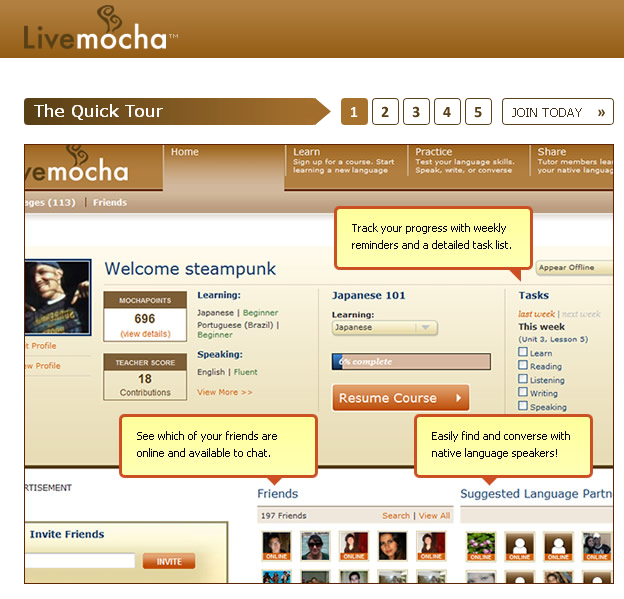 Livemocha is the world's largest online community for language learners, with free lessons and a global community to help you learn a new language. Teaching Foreign Languages K–12 is a video library illustrating effective instruction and assessment strategies for teaching foreign languages. The language classrooms shown in this library include Spanish, French, German, Japanese, Italian, Latin, Russian, and Chinese. All classroom videos are subtitled in English and are appropriate for K–12 teachers of any foreign language. Click here to access the videos for free! (Make sure your browser's pop-up blocker is turned off).